In general, loans fall into two categories, secured or unsecured. You have to provide an asset as collateral for a secured loan, but you will also have more benefits available to you for the loan, such as a better interest rate and potentially even a larger loan amount. If you’re thinking of using collateral to secure a loan, it is important to understand what it is and how it works. A secured loan involves promising an asset as collateral for the loan. In the event that you stop making payments, your lender can repossess the asset you put up as collateral, sell it, and then collect the money they are owed. Examples of secured loans are mortgages and car loans. Any loan that does not involve collateral or promising an asset is an unsecured loan. Examples of unsecured loans are student debt and credit cards. Why Do I Have to Provide Security to Get Approved for Certain Loans? By providing collateral for a loan, you are making yourself a less risky candidate to the lender because they have an asset to sell as a back-up if you miss payments or default. The lender will want to ensure that they receive at least some of the lent money back, collateral ensures this is possible, hence why some lenders make collateral mandatory. Without the collateral, the lender could risk losing thousands of dollars, a risk they don’t want to take. Should I Choose a Secured Loan or an Unsecured Loan? As with most things, what works for you might not be ideal for someone else. To determine if a secured loan or unsecured loan is better, you will have to consider and analyze your financial position. Poor credit. It will be challenging for you to get approved for a loan as is, security will improve your chances. Ample existing debt. The more existing debt you have, the higher your debt to income ratio will be which makes it challenging to qualify for unsecured lending. Debt free valuable asset(s). By owning a large asset outright, such as a home or car without debt, you’ll be able to use it as security for a loan. Sole proprietor. It can be challenging to prove that you have enough steady income to support a loan to a lender without security as a sole proprietor. Usually, lenders have restrictions on assets or other collateral that can be used for specific loans for both individuals and businesses. Here are the three major types of loans, personal, vehicle, and business, as well as the most commonly used collateral for them. Trying to find the right personal loan for you? Click this link. Here’s how to use assets secure funding for your business. Is Your Asset As Valuable As You Think? Often, lenders offer you less money than the value of the asset you’re using as collateral, generally between 50% and 90% of the total value. In some cases it can actually be lower depending on the creditor and the asset type. This means that the actual value of your asset won’t be used for the purposes of your loan. In the eyes of the lender, your asset isn’t as valuable as you may think. As an example, if you use an investment portfolio as collateral, the lender may only offer 50% of the total value to factor in the potential variability of the investment. On the other hand, lenders tend to give you up to 80% of your house value if you use your home as collateral. 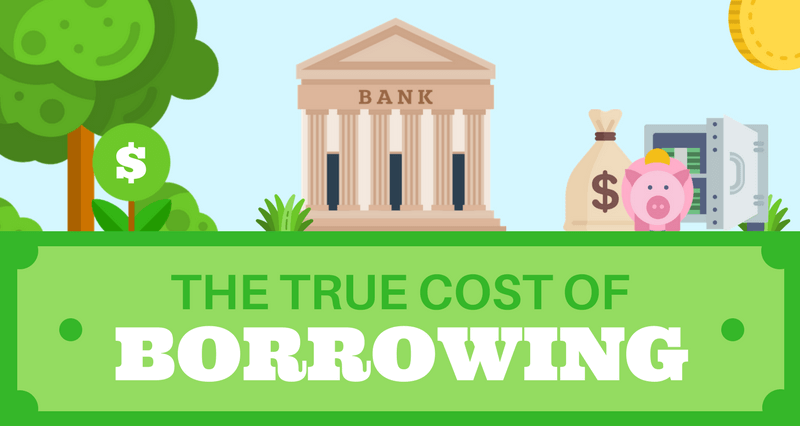 Check out this infographic to learn all about the true cost of borrowing. Pros and Cons of Secured Loans? Better chances of getting approved. By using collateral to secure your loan, you are lowering your risk to the lender which will better your chances of approval for a loan. This is still true if your credit isn’t the greatest because you have something that is worth enough to pay back the loan in the event that you miss a payment or default. Lower interest rates. Generally, secured loans have more competitive interest rates than unsecured loans. Even if you have poor credit, you can still achieve a lower interest rate by using collateral because your risk is perceived as lower to the lender. Ability to negotiate. If you use collateral for your loan, it gives you more room to negotiate terms that work best for your budget. You can negotiate to lengthen the loan’s term to get smaller monthly repayments or shorten the loan term to make the whole loan cheaper, whichever would benefit you the most. Need an online loan with affordable monthly payments? click here. Repossession. If you default on a loan, you will lose the asset being held as security. Of course, no one intends to lose the asset, but sometimes life does things to us that are out of our control. Too much spending. Using security for a loan usually means that you have more flexibility in how much money you can withdraw. Be sure to fully consider your financial position first before taking out debt that is unrealistic and out of your budget. Extended term. If you want lower payments, a longer repayment term sounds great. Although be wary, it also means you’ll be paying more interest which increases the total value of the loan. Read this article to find out how you can get a car loan after a repossession. Any loan that is not secured by collateral or an asset is considered to be an unsecured loan. Unsecured loans are actually quite common and the biggest benefit is you don’t put your valuable assets at risk. Typically, you can get an unsecured personal loan with good rates if you have any of the following: good credit, steady income from a full-time job, or a low debt to income ratio, 43% or lower to be specific. Still interested in asset-based leasing and financing? If so, check this out. Now That You Know, Get the Loan! Now that you know more about secured and unsecured loans, your next step is to apply for the loan you want. If you’re looking to apply for a loan, Loans Canada can help you apply for both secured and unsecured loans today.